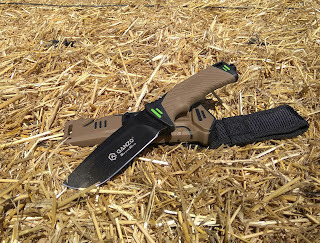 Best Chinese Knives: Ganzo G8012 Fixed Blade Survival Knife Review! 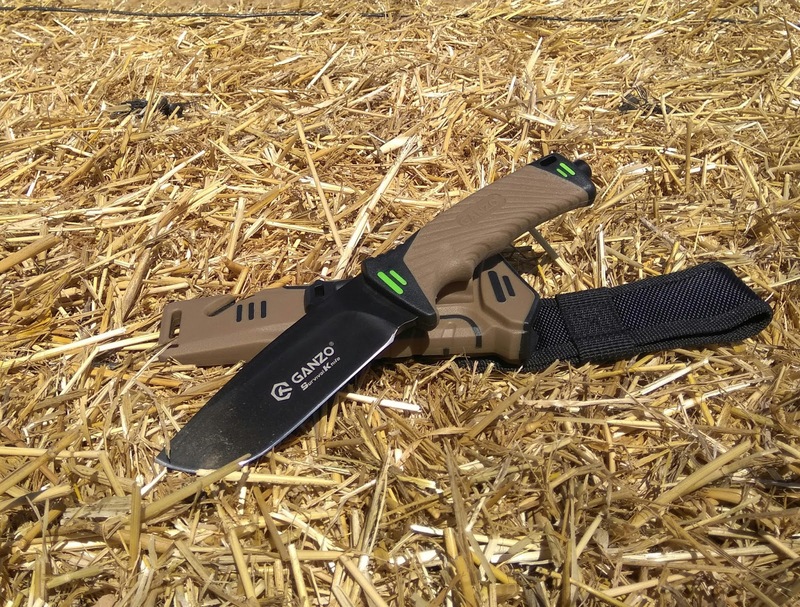 Ganzo G8012 Fixed Blade Survival Knife Review! So I got this one as well a few weeks ago and feel that I can now make a review on it (after testing it out). 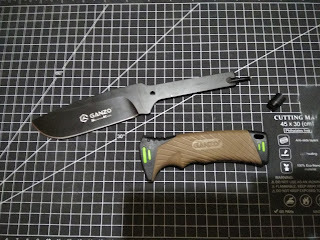 The knife came in 2.5 weeks directly from China (got it from GearBest). It arrived in a pretty simple Ganzo branded cardboard box. The G8012 was pretty sharp out of the box (shaved hair) and had no quality issues. Out of the box it cut paper with no drag and shaved arm hair. Sits tight in the sheath - no rattle at all and couldn't be shaken out (unless using extreme and improbable force), even without the Velcro strap. With that strap it is impossible. The cord cutter (which is often confused for a seat belt cutter) works well and allows to cut cord one-handed and without taking the knife out of the sheath. The included ferro rod gives out good sparks and I reckon will be enough to make a fire in the outdoors.The knife itself chops and carves wood pretty well, the tip is strong enough to take abuse and passes the tip test with flying colors. The only thing I didn't test was the very coarse diamond sharpener on the back of the sheath cause there was no need to and I didn't want to use it on a knife that is still sharp. - The execution. The knife is genuinely well made. The handle and the sheath are rubberized (for your pleasure) and the fit is excellent. No rattle or unnecessary movement from any part. - The ergos. The knife fills the hand great and is very comfortable and pleasant to hold and use. - The attention to details. Starting from the uncoated area on the top of the blade to use the ferro rod, to the checkering on the back of the "stryker" at the tang, no corner cutting on this one. - Although the blade shape could remind some of Moletta designs - the overall design is original and couldn't be called a direct clone of any other knife (if you do know of a knife that is 100% similar to this one - please write in the comments). - The steel performed well and stayed reasonably sharp after the tests. - The added features. 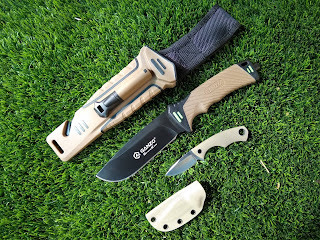 With this knife you get a cord cutter, a ferro rod, a striker/hammer and even a coarse sharpener built in, so it could cover most of your survival needs. Great features for the price. - This knife really gives you enough confidence to actually use and to rely on it for camping, hiking and even survival situations. My experience tells me it won't fall apart or fail during those. - The price. The fact that you get a knife with original design, this well made and has all those features for this amount of money is not less than amazing. - The knife isn't full tang. Could be disassembled and cleaned on the inside using a torx on the striker. With that, it holds very well and they did apply a white thread locker on the screw to prevent unwanted opening. Like I already mentioned - no corner cutting on this one. - The GITD inserts serve no real purpose as they aren't very bright and don't accumulate light well. Could easily lived without those. - The sheath is much longer than the knife itself cause they used separate blades for the cord cutter and put an extra mounting opening at the end of it. - The Velcro strap does make the knife impossible to shake out, but feels too thin and flimsy (not the best stitching job either). I would really prefer it to be thicker and to have an extra button. Luckily it could be modded and could be folded back (the knife will probably stay in the sheath even without using it). - Can't really find anything ugly about this knife, especially for the price. 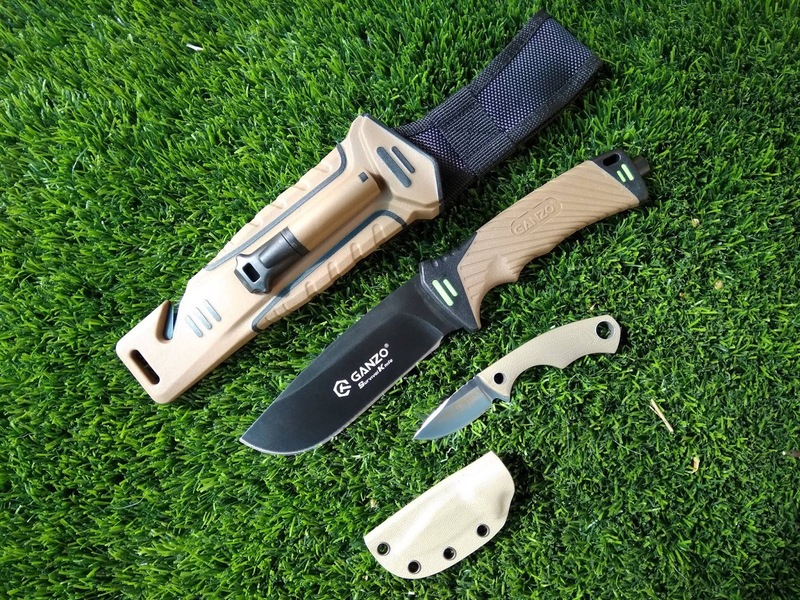 - The quality + fit, finish + added features (cord cutter, ferro rod, striker/hammer and a coarse sharpener) + the ergos + the fact it has original design + the performance + the confidence to use (built well and smart) + the attention to details + the price - the drawbacks make this one of the best budget survival style knives on the market as of today IMO. It pleasantly surprised me and I am very glad I got it. Thank you for your review! I've bought the black one from GearBest (it's on flash sale right now) few weeks ago and it came without the ferro rod / fire steel :(. I've contacted the support and they insisted that it shouldn't be included, even though it's on the pics and in some users' reviews. However I'm not the only one who got if from them without the fire steel. > According the shipping policy, we cannot add the Firesteel for the item, it is dangerous on the way to the destination， so we cannot send it to the customers. I'm really surprised, that doesn't make any sense (ferro rod itself isn't flammable). Probably some misunderstanding in the CS, keep pushing I'm sure they will eventually ship it. Thanks. They offered me 150 points as compensation and told me to buy the fire steel by myself. I would like the matching Ganzo one though. 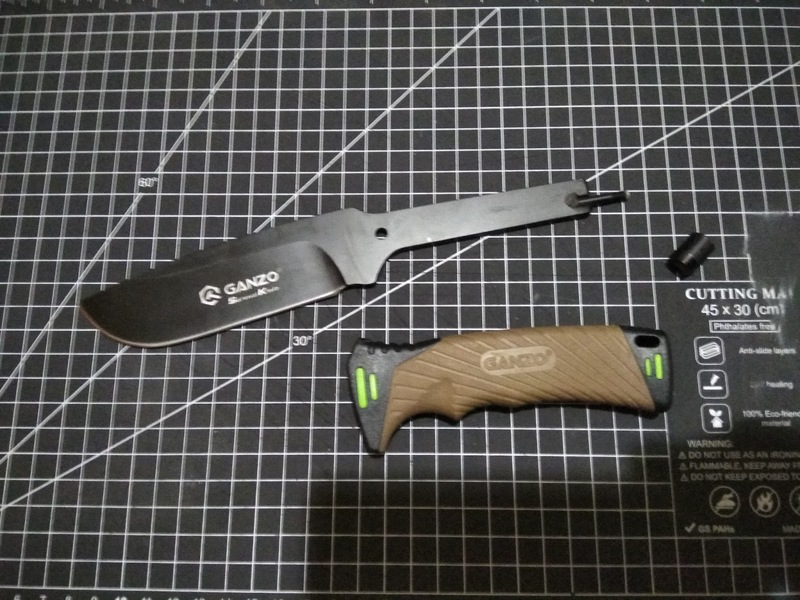 I have made like 50 orders with them and most of my Ganzo collection came from GearBest. My experience with GearBest CS is, unfortunately, not very good. The first response is always recapitulation of the order like 'we have shipped this SKU' and I have to repeat myself multiple times, it gets exhausting. Last time I had issue with Ganzo G7522, which came with stripped pivot screw. > He said ferro rod gives out good sparks, it doesn't means firesteel (Flintstones). It clearly shows the ferro rod/firesteel. Thanks a lot, I will.